4 star category - 1st row to the sea - boat dock! 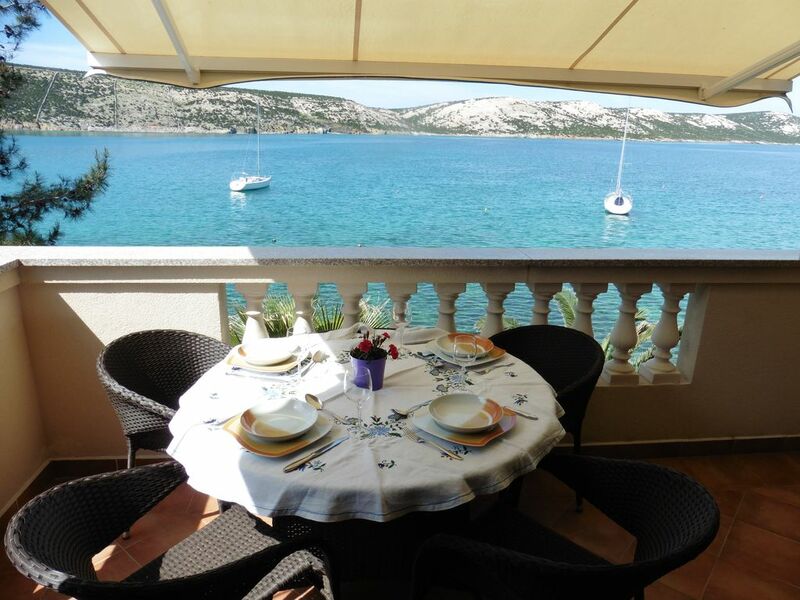 Our apartment is about 42 square meters, situated on the seafront and recently stars from the local tourist board as 4 Apartment categorized, what is to be found rather rare in Croatia. The apartment consists of a bedroom, a living area at the same time as a sleeping area (. 2 Bedroom) are used, a bathroom with shower and a 10 square meter sun terrace. All rooms face the sea. The private beach is actually located right in front of the apartment! The motto is: Enjoy and make fully relaxed holiday! Direct sea view and private beach in front of the apartment. The apartment is fully equipped with everything you need (at home). A complete kitchen, a new bathroom with shower. Sheets and towels, duvets and pillows. On the terrace you can have a good time and enjoy the sunset in the Mediterranean ambience. A washing machine, an iron and an ironing board are available as needed. The living room couch can be pulled out and provides for 2 additional person (200 x 130cm) adequate place to sleep and is very convenient. Even lying down (from the couch) look at the sea. A private parking space (C6) is located behind the house and is largely protected from the sun during the day. A German and international television program is available via satellite digital LED TV available, so you need not miss any shipment from home. An awning will protect you if necessary before the sunlight. The use of all living objects such. B. Machine, WiFi high speed internet, air conditioning, refrigerator (with freezer), stove, towels and bed linen, are included in the price. An iron and ironing board are available if needed also available for free. Has its own assigned private C6 is located directly behind the house. Ideal for boat owners! Directly in front of the apartment and from the terrace visible we be happy to supply a buoy available. The neighborhood is very pleasant. There is a spirit of cooperation and invites you to come back. has The bay of Stara Novalja what magic touch. The sea is especially in the morning very quiet and smooth as glass. In the evening, the sunset, the steam comes directly on the terrace spoils. Since Novalja is a quiet place and nightlife in 2km distant Novalja and Zrce takes place (5km), you can sleep at night very relaxed and ready. Restaurants and grocers are within walking distance (about 150 meters). There are three diving centers in Stara Novalja and numerous surrounding beaches. From the island from the numerous national parks and historic sites are easily accessible. The beautiful party beach Zrce and the picturesque town center of Novalja invite at any time to linger. The international bestausgezeichneten Pag cheese you have to try! The island of Pag has countless beaches and coves that are child-friendly and easily accessible especially and some of which is also can enjoy the high season on their own. But within 10 km there are 8 beaches, which are awarded the blue flag. The coast of the island of Pag stretches over 300 km in length, of which about 84 km of sandy and pebble beaches. The water around Pag is one of the cleanest areas in the Mediterranean. In underwater partially visibility of up to 40 meters possible, which is otherwise rather reserved regions in the Caribbean. Great location, well kept property! I could have stayed another week. An addition of a microwave would be nice. Wir haben Anfang September zwei schöne Wochen in dieser gut ausgestatteten Ferienwohnung verbracht. Frühstück auf dem Balkon mit herrlicher Aussicht auf die Adria. Besonders gut hat uns die tolle Lage am Wasser gefallen. Jederzeit war ein Sprung ins erfrischende Nass möglich. Das Appartement ist wie beschrieben, modern eingerichtet, wir haben uns dort sehr wohl gefühlt. Sehr netter Kontakt mit dem Vermieter. Das Meer ist in einer Minute zu erreichen. Wir können es nur empfehlen! ! Traumlage direkt am Meer mit gigantischen Ausblick. Perfekt eingerichtet .Der Vermieter ist gut erreichbar und zuverlässig. An alles ist gedacht. Sehr empfehlenswert. Wie beschrieben, schöne Ferienwohnung mit allem was man braucht. Wir haben uns sehr wohl gefühlt, gern kommen wir wieder. protected from southern and northern winds. For cyclists, the island of Pag with many cycle paths an unforgettable experience because of their unique natural beauty. If you need more tips for exploring the island and the surrounding area, I will be happy to put together some highlights as needed. Bei Verlassen der Wohnung: Terrassenmarkise muss eingefahren werden, Fenster und Terrassentür geschlossen und Klimaanlage, Licht und TV ausgeschaltet sein und keine Küchengegenstände wie Gläser, Tassen Geschirr etc. dürfen auf der Terrasse liegen bleiben. Sämtliche Schäden gehen zu Lasten der vom Mieter eingezahlten Kaution und ggfs darüber hinaus. (Siehe separate Mietbedingungen.) Kein Gästebesuch und Haustiere erlaubt.